Agassiz Basin is named after Louis Agassiz, a Swiss scientist often credited by many for the discovery of the most recent Ice Age. Two small falls can be found here. 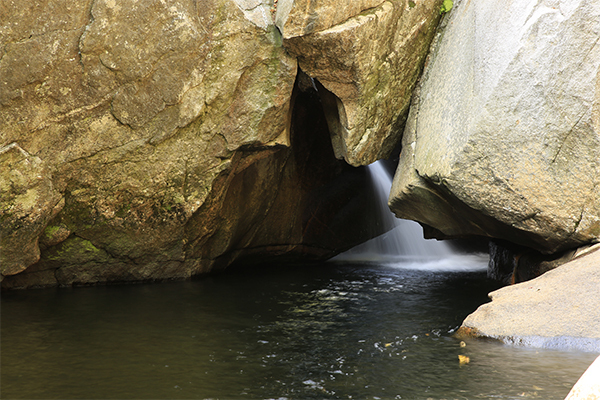 Although the waterfalls are by no means large or of striking beauty, the area around the falls is of historical and geological interest. The waters of the curved gorge created a gap about six feet wide that is known as Indian Leap. There are legends that Native Americans used to jump across the gap as a test of courage. Also of particular interest are the deep, circular potholes and the deep, mostly dark pools in the river. The best view of the lower falls is obtained by scrambling down to the river. The upper falls can be viewed by scrambling on some of the rock ledges just below a white building, but be careful as the terrain here is slippery and offers minimal grip. This is a property that I hope the U.S. Forest Service ultimately purchases and adds to the White Mountain National Forest. 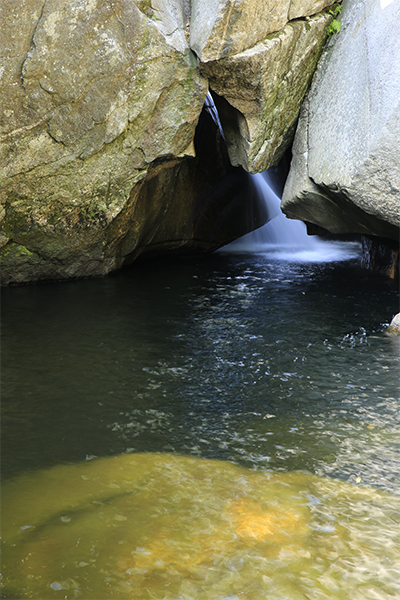 It is of special geologic significance and is one of the premier swimming areas in the national forest. To get to the falls, follow any of the trails that stem from the parking areas down to the brook. You'll have to do some fairly difficult scrambling if you want to get a good view of the major falls here. From I-93 in Lincoln, take exit 32. Turn onto NH 112 west, heading towards Woodsville. Continue traveling on NH 112 west for 1.7 miles past the junction of US-3 and NH 112. The falls are located behind a white building, currently serving as an antique shop but has previous been a restaurant known as Govoni’s. Future public access of this waterfall may change with any shift in ownership of this property. If you encounter any private property notices during your visit, please respect the owners’ wishes and find another nearby waterfall to enjoy. To get to Lincoln, take I-93 north from Concord or I-93 south from Franconia. Alternatively, you can take NH 112 west (the Kancamagus Highway) from Conway. The bridge that was mentioned in the 2nd edition of the New England Waterfalls guidebook has been removed. However, the falls can still be seen in full from near the parking area. Also, please take note that this is private property but respectful public visitors appear to be welcome (please 'leave no trace' so that it can be kept this way).